Don't forget to read Part I here! The fashion crowd has left Paris. The endless Instagrams of the Eiffel Tower and the Jardin de Tuileries have come to an end. The world's top fashion designers have presented their Spring 2017 collections and are now prepping for the next season of fashion. It's a quick-moving world, but before we move on, let's take a look at the best stories, trends, and shows from these last few days of Fashion Month. For many years, Maria Grazia Chiuri and Pierpaolo Piccioli were a fearsome design duo who worked together to create breathtaking collections for Valentino. But this season, Chiuri took over as head designer at Christian Dior following Raf Simon's departure, leaving Piccioli as the solo designer at Valentino. Before their solo debuts, the question was how this team would work individually, without the balance of the other. Now that we've seen the results, it's clear to see how each designer contributed to their collective Valentino vision, but as separate entities, one collection stood above. 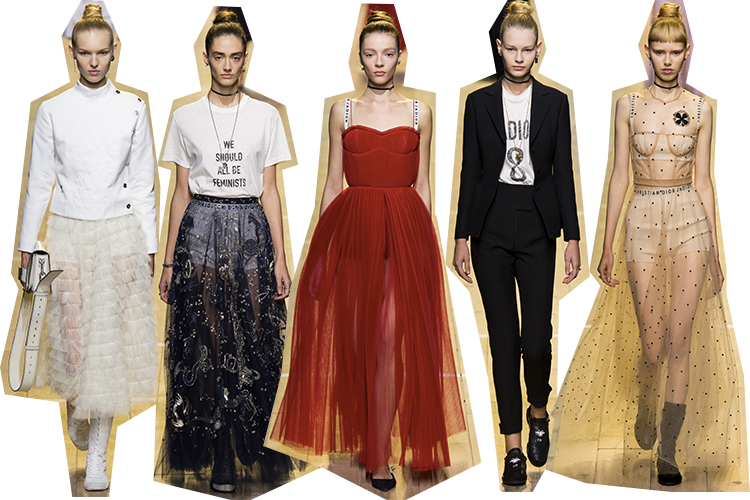 At Dior, Chiuri presented a lovely collection of airy chiffon skirts, fencing influences, and tongue-in-cheek T-shirts. The end featured a group of delicate beaded gowns with tarot card motifs in a style that has become her signature. The obvious references to the future and also to feminism (Chiuri is the first woman to be head designer at Dior for the entirety of the brand's existence) were fun, if not a little too on the nose, but my main issue was that she stayed very much within her Valentino comfort zone, and the end result felt far away from the design codes of Christian Dior. Perhaps Piccioli had the easier task, then, to simply continue his efforts at Valentino. No new archives to mine, no new ethos to put forward, and he did wonderful things sans his old design partner. Piccioli's spring collection was simply stunning, and it felt very much in line with the heritage of the house while maintaining a fresh attitude. It was romantic but strong, as the Valentino woman should be. I remember the first few collections following Mr. Valentino's retirement were frustrating for me because they didn't feel in line with the original designer's ideas, but now I've grown so used to what Chiuri and Piccioli did for Valentino, so maybe all Chiuri needs is some time. You can always count on Miu Miu for a fun close to Paris Fashion Week. 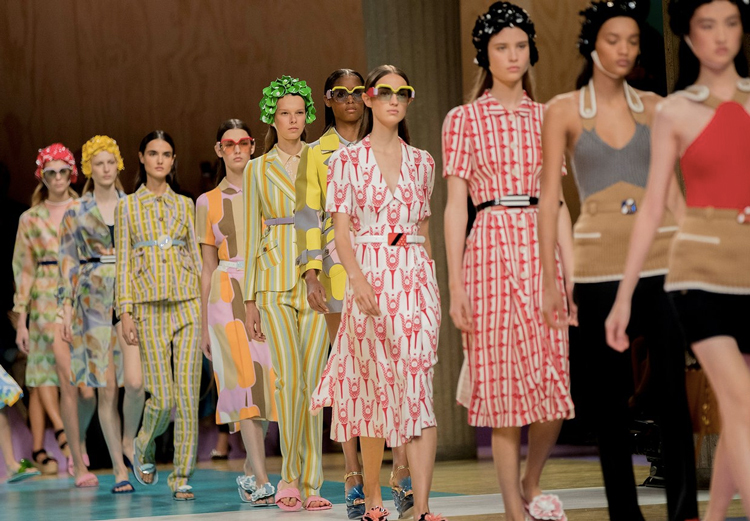 For spring, Miuccia Prada dove into the world of poolside attire and synchronized swimming, adorning her models in frilly swim caps, Adidas-style shower slides, and coats draped to look like wrapped towels. Infused with candy-colored coats and psychedelic patterns, these clothes are sure to be the envy of every fashion editor for their March issues, and the accessories—including flatform sandals and enviable handbags—are sure to do well commercially, as is the Miu Miu way. 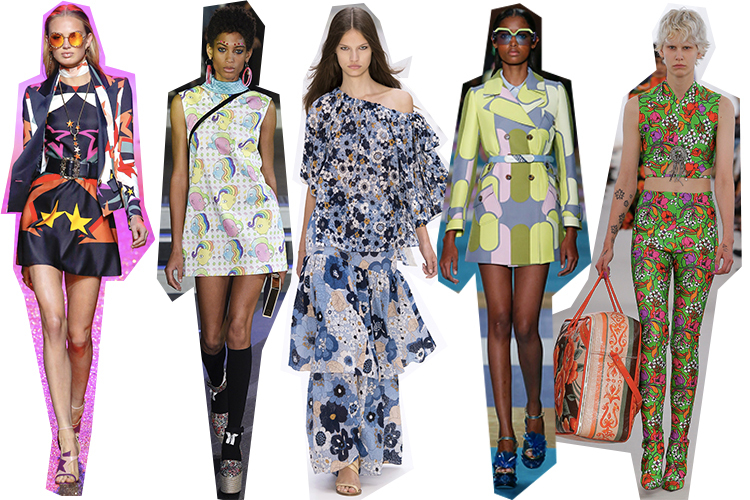 Spring collections are always heavy on colors and patterns, but Paris took it into high gear with a number of psychedelic prints. Elie Saab was totally starry eyed with colorful star motifs throughout the collections. Miu Miu looked straight out of Mad Men with pastel geometrics. 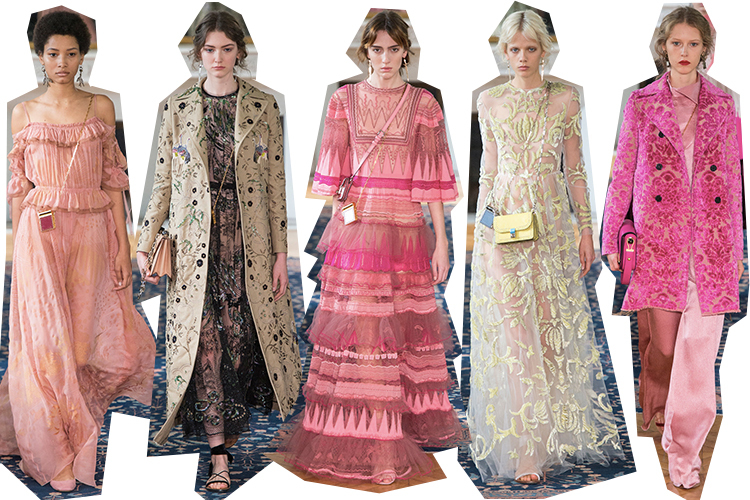 Chloé, the boho brand for the modern girl with a penchant for the 70s, featured some pretty floral patterns. Hopefully you're sensing a trend like I am! Most fashion designers turn to history for inspiration, but Karl Lagerfeld is constantly fascinated with the modern world and even the future. He turned the Grand Palais into a maze of computer hardware, with models in sideways baseball caps and typical Chanel pieces (tweed, pearls, interlocking C logos) winding their way through the technology. The clothes weren't as literal as they can be at Chanel, though the colorful tweeds and the metallics make reference to tech. Plus, there was a novelty robot bag that will be a favorite among street style stars for sure. This wasn't my favorite Chanel show—not after that incredible resort show in Cuba—but it was fun. You can always count on Lagerfeld for that much. Who would have thought that so much of the conversation this week would have little to do with clothing? 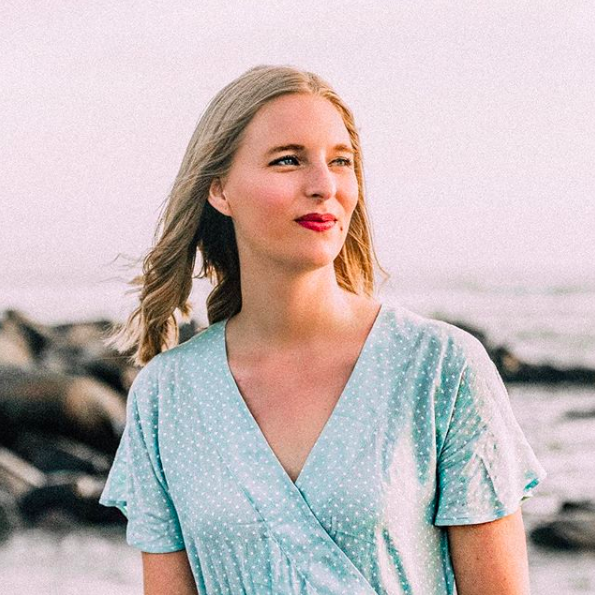 At the end of Milan Fashion Week, it was the prevalence of fashion bloggers at runway shows that drew the ire of the Vogue editors, leading to a lively conversation about the importance of social media influencers and their place in the world of high fashion. This week, Kim Kardashian's terrifying robbery was blamed on overzealous social media use that easily revealed locations and emphasized expensive possessions. Kardashian's ordeal serves as a warning to other social media stars who share every detail of their life, and has made many question the consequences of sharing personal details online (our parents warned us in the 90s, I guess). In any case, it was fitting that blogger (or influencer? street style star?) Chiara Ferragni wore a sassy "I Heart Haters" T-shirt to the Louis Vuitton show on the last day of Paris Fashion Week. It was the perfect message to send to naysayers, especially at one of the hottest shows in Paris, and a fabulous way to end the week. What was your favorite collection from Paris Fashion Week?